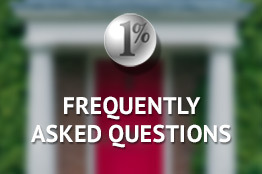 What is the DEAL with One Percent Realty? One Percent Realty’s goal is to deliver Superior Value to our clients by providing excellent service for a great price. Our studies have shown that consumers generally agree that there is a need for real estate professionals. Consumers do find value in the services provided by real estate agents however, they want to pay a price that is fair. At One Percent Realty we strive to deliver a high level of quality service for a good price. We are a full service real estate company. Full service means: we provide marketing and pricing advice, advertise the property, arrange viewings, host open houses, negotiate sale contracts, handle paperwork, digital photos, yard signage, and more. Everything you would expect your real estate agent to do. It also means that we will list the property on the MLS® so it will be on realtor.ca. In short, you do not sacrifice anything in terms of service when you hire us. Just like other real estate companies, we sell our services for a fee. This fee is called a commission. While our studies showed that people recognize the need for real estate professionals it also showed a prevailing sentiment that the fees commonly charged for these services are too high. It should be noted that commissions are not set or regulated. Commissions are negotiable. Brokerages are free to charge whatever they like for the services they provide. Even though fees are not regulated, over time, there has developed a range of fees that is generally considered to be the ‘normal’ commission rate. Examples of common commission rates charged by other full service brokers include: 7% on the 1st $100,000 and 3% on the rest. Or even a straight percentage rate ranging from 4%-6% of the sale price. As property prices have increased year after year the fees for real estate services have also become higher and higher. This is due to most commission structures being based on a percentage of the sale price. So, the cost for real estate service has increased dramatically but, the level of service has remained the same. No wonder consumers feel the rates are too high. When the price goes up but the product or service stays the same - that is actually a decrease in the value received by the consumer. The Deal is... Superior Value! Superior Value comes from delivering the best service for the best price. 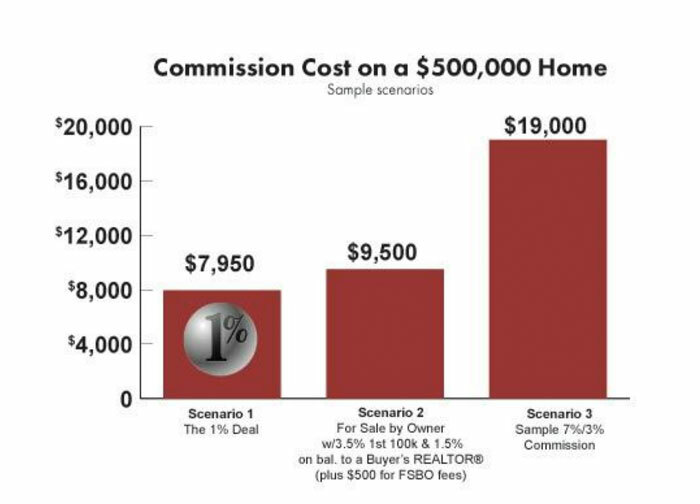 The One Percent deal is this: we provide full service for just $7,950 on homes sold under $700,000 and for homes over $700,000 we charge 1% plus $950. The $950 portion covers the typical disbursement costs associated with marketing and selling your home. Our agents will provide all of the same services you would get if you were to go with a higher commission company. The only difference is the amount of commission you will pay. Your 1% agent will help you determine the appropriate listing price, list your home on the MLS® and the popular realtor.ca, enter the listing on onepercentrealty.com, take interior and exterior digital photos, place a for sale sign (if applicable), advertise your property where the Buyers are looking, show your home to prospective Buyers, provide you advice and assistance along the way... Our goal, like yours, is to sell your home. *compared with a broker charging 7% on the first $100,000 and 3% on the balance, not all brokers charge the same. So, how are you able to provide such great service for such a great price? There are 4 main things that make it all possible. Our Company is structured differently from the traditional full service brokerage models. With the help of the technological advances such as the Internet, cell phones and electronic signing, etc. One Percent Realty was able to reduce the typical real estate office overhead as well as leverage the productivity advances of its agents to create a successful commission model. This greatly reduced overhead cost does not impact the delivery of services. Reducing operational costs allows us to charge less but net about the same. In other words, our agents might gross less but, they keep more of what they make. It’s not what you make - it’s what you keep! The second thing is technology. There have been many advances over the last decade that make it possible to do what we do. Advances in technology are certainly a huge part of it. Huge advances in communication methods, the biggest advance being the the internet and realtor.ca. We are huge supporters of the local MLS® boards. The advent of the internet and the overall success of the MLS® systems makes the One Percent Realty concept possible. Since virtually all full service companies charge about the same rates for pretty much the same services it is extremely difficult to build a successful business under the traditional models. Spending most of their time prospecting for business, the traditional agent requires a higher commission structure to compensate for the lower volume of leads and lower number sales in the highly competitive real estate industry. Because of our lower fees our agents enjoy a higher volume of leads which results in more listings and more sales. Whereby our agents may earn less per sale, they make up for it in a higher volume of sales at the end of year. But, its not about what we make, its about what you keep! It is a win - win scenario. Our agents are able to earn a decent income, and our Sellers save thousands in commissions. 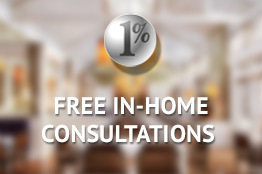 We say at One Percent Realty, the more deals we do, the more money we are saving our clients! Prior to the Internet, Buyers used to get in the back seat of a REALTORS® car and go on a tour of homes. The REALTOR® would have their own MLS® catalogue of homes which he was not allowed to give Buyer's a copy of. REALTORS® controlled MLS® information. This is simply not the way it happens anymore. Today, because of the Internet, consumers are empowered and in much more control of their new home search. Over 85% of Canadians who search for a home start their search on the Internet. Whether Buyers are looking for properties themselves on realtor.ca, or being automatically emailed MLS® properties directly from their REALTOR®, or other house hunting activities, nowadays Buyer's often know as much or more about their particular market and the homes for sale in it as their REALTOR® does. When a Buyer sees a home that meets their criteria and is their dream home they do not ask "How much commission is being paid here." It's not of concern to the potential Buyer. The Buyer is concerned with number of bedrooms, bathrooms, location, schools, and obviously the price. Our listings are displayed everywhere that all the other listings are. If you are a buyer looking in a given neighbourhood in a given price range (which is basically all of them), then you will want to see every listing in that neighbourhood in your price range. With the Buyer now in the driver's seat as a much more sophisticated consumer the real estate marketplace had changed forever. A good product - Well priced - Will sell!! If your home is well kept, and priced accurately, it will sell. In other words, properly pricing your home is the biggest factor when it comes to salability. Not commission. It has no relationship with the amount of commission you pay. With extensive experience in project marketing, we realized that there may be an opportunity to market houses in a similar lower commission higher volume manner. The simple answer is yes. Our MLS® listings are shown, and sold, by lots of Cooperating REALTORS® all of the time. Logic would dictate that if our system was unable to attract Cooperating REALTORS® to sell our MLS® listings then we would be selling most of our own listings to our own Buyers. In fact, its quite the opposite. Over 80% of our listing sales are sold by Cooperating REALTORS® who represent the Buyer, which is in-line with industry standards. This is the proof that our system works. Why is that? We believe it is two reasons. First, our listings (under $700,000) typically offer $3500 commission to Cooperating Brokers. While $3500 might not be as much as some of the other listings, it still is a decent amount of money for a paycheque for Canadians these days, including a lot of REALTORS®. The more important reason why other agents cooperate and sell our listings is that Buyers don't care about commission. Buyers are always looking for the best value - regardless of the commission. Buyers don't care what the Sellers needs are, what the Sellers want in their pocket, what their mortgage penalties are, and the last thing on a Buyers mind is how much the REALTOR® is going to make. They care first and foremost about value. Buyers always want to get a great buy. As mentioned above, if the Buyer loves the home, does the amount of commission matter to the Buyer? Spending $12,000-$20,000 or more to sell your home is a lot of money. If you are thinking about selling your home call your regular agent that you used last time, but this time also call us to compare our services and commission rates. Being full service agents means our agents provide free no obligation market evaluations just like the other guys. Please don't let someone else tell you about our system, let us tell you exactly what we will do to sell your home. You and your hard earned equity will be glad you did. Its time to shed a little light on this, at least from our perspective. The new MLS® rules allow for a licensed REALTOR® to do what is referred to as "mere-posting" a listing onto the MLS®. They will charge some sort of nominal fee for this. The idea here is to allow people to market their properties themselves, (For Sale By Owner) and do all of the work themselves. Option #1 - Sell it through the traditional "higher commission companies" who will place your property on MLS® and provide full service real estate. Depending upon what your home is worth, this will cost a fair amount of money, though it will vary across the country. A $400,000 home will normally cost somewhere between $15,000-$24,000 through a company like this. Option #2 - Sell it through One Percent Realty. We will charge you $7,950 for this same $400,000 home, with all the services and exposure that you would receive from the traditional higher commission companies. This fee also includes payment to the buyers agent ($3500). We do open houses, handle the showings, negotiations, and all the paperwork that you would expect from any full service real estate company. In short, the services and exposure are the same as you would get from option #1 above, but for way less money. There are no "up-front" fees either. We get paid for performance, so, if your house doesn't sell, you owe nothing. Option #3 - Sell it yourself. You can now put your home on MLS® and have your home exposed with all the other listings, and deal directly with the public or REALTORS® who may want to show your property. This type of service usually involves an "up-front" fee so, the service provider doesn't have any real interest in if your home sells or not. Also worth noting, is that since your property is on the MLS® system you will have a reasonable chance of dealing with a buyer's agent. These buyers agents will expect to be paid and will negotiate a commission with you. Most likely, they will be looking to the Seller to pay them something, probably at least half, of the fees discussed in option #1. So again, if we use the $400,000 home as our example, a buyer's agent will be expecting to receive between $7500-$12,000 to sell your property. So, if you can have the full services of our professional REALTORS® for $7,950, why would you not just leave it to a professional?